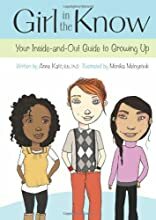 With a relaxed, conversational approach, Girl in the Know is a straight-talking little manual packed with everything a girl should know about the many changes she can expect in puberty and how to make her way through it all as smoothly as possible. But there s way more than just the body basics the book is divided into three main sections (Your Body, Your Mind and Taking Care) where girls will find advice on their sexuality, mood swings, crushes, health and much more. About Anne Katz (Author) : Anne Katz is a published author of young adult books. A published credit of Anne Katz is Girl in the Know: Your Inside-and-Out Guide to Growing Up. About Monika Melnychuk (Illustrator) : Monika Melnychuk is a published illustrator of children's books. A published credit of Monika Melnychuk is Pizza Time.